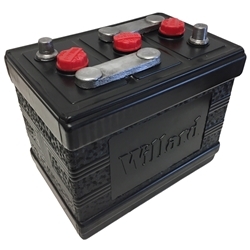 Optima Tar Top Battery. AVAILABLE AGAIN!! Optima Tar Top Battery. These are the most accurate batteries available today for your vintage WWII jeep. They will also out perform any lead acid battery in cranking amps and longevity. Additionally they will never spill acid on your chassie or axles since they are sealed.